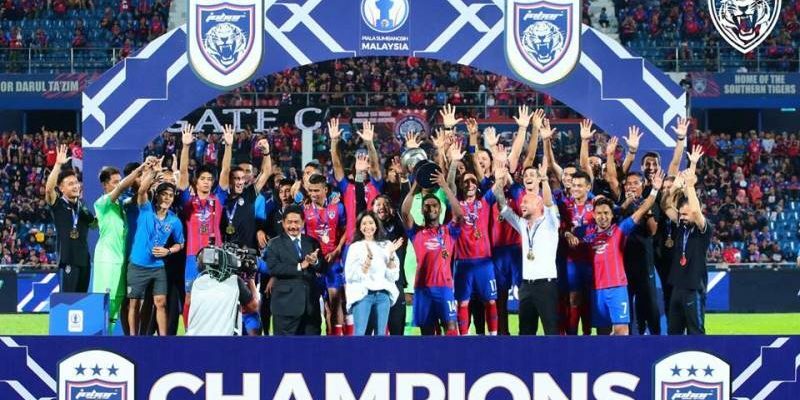 JOHOR BARU (3 Feb 2019) – Five-time Super League champions gave a dominant performance but could only get a 1-0 win over Malaysia Cup champions Perak to retain the Charity Shield to kickstart their campaign on a winning note at the Larkin Stadium in Johor Bahru on Saturday. This is the fourth time that JDT have won the curtain raiser in the last five years while for Perak their 13-year wait for the Charity Shield continued on a night when the Bos Gauros could have snatched an injury time equalizer but Shahrel Fikri muffed the golden opportunity. The win also gave the Southern Tigers three points in the Super League and strong signals that they will be the team to beat although strong contenders Pahang, Melaka United and Kedah also won their opening matches. Pahang beat Kuala Lumpur at the KLFA Stadium in Cheras on Friday while Melaka United defeated PJ City (formerly known as MIFA) 2-1 at the Hang Jebat Stadium and Kedah roared to a 2-0 win over Perak SEDC (PKNP) at the Manjung Municipality Stadium. JDT were all over Perak in the first half and it was dominant show for the Johor outfit. Perak remained in business despite until the 40th minute with their national custodian Hafizul HakimKhairul Jothy making the difference with clinical saves from Safawi Rasid, Gabriel Cabrera and Aaron Niguez. New signing Zac Anderson and skipper, international Shahrul Saad had to work overtime to keep the marauding JDT players at bay. JDT would have gone 1-0 up on 31 minutes when Hafizul denied Cabrera a sure goal, coming off his line to stop the Argentine. Cabrera appealed for a penalty but the referee ignored his pleas much to the dismay of the JDT bench. However, Cabrera made it count in the 40th minute. Aaron Niguez seemed to have miskicked when challenged by Anderson on the left and the ball rolled to Cabrera who put the finishing touches with a sublime chip over Hafizul. JDT 1-0. Perak gave a better performance after the break but simply could not breakdown the JDT backline on a night when the home supporters got a glimpse of Diogo Luis Santo in injury time when he replaced Shafiq Ahmad. “We missed Gilmar (Filho). Gilmar is big and strong and could have made the difference,” said Perak coach Mehmet Durakovic on his Brazilian who sat out the match to serve a one-match suspension for a red card offence in last year’s Malaysia Cup final against Terengganu.